Slice half the onion. Put whole capsicum, and onions in a large roasting tray drizzle onions with olive oil and spinkle with salt. Roast at 240 deg celcius for half an hour. Add mushrooms and tomatoes and roast for another half an hour or till mushrooms are slightly crispy. Bring capsicum out and cover in a bowl to steam. Leave onions and mushrooms in oven to keep warm. Bring vegetable stock to a boil. Meanwhile dice remaining onions and add to cous cous and seasonings in a medium. Pour in half a cup (equal volume as cous cous) of boiling stock and cover. Put salmon steak into simmering stock, the stock should only come halfway up the salmon steak. Spoon hot stock onto the fish to cook it till it do not look rare on the outside. Cover and turn off the heat after 2 minutes. Allow it to steam in the pot for another 5 minutes. 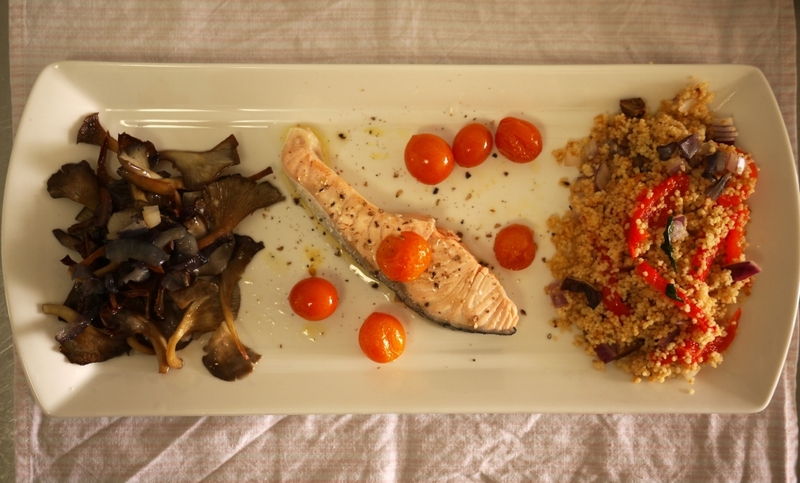 When the fish is done (check by cutting it in half), uncover the cous cous and fluff up with a fork. 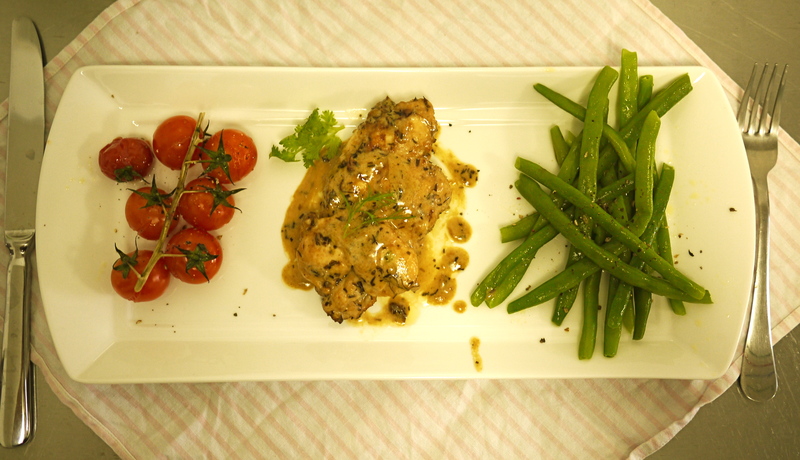 This entry was posted in Cook and tagged Plat du Jour on April 28, 2012 by three3seconds. 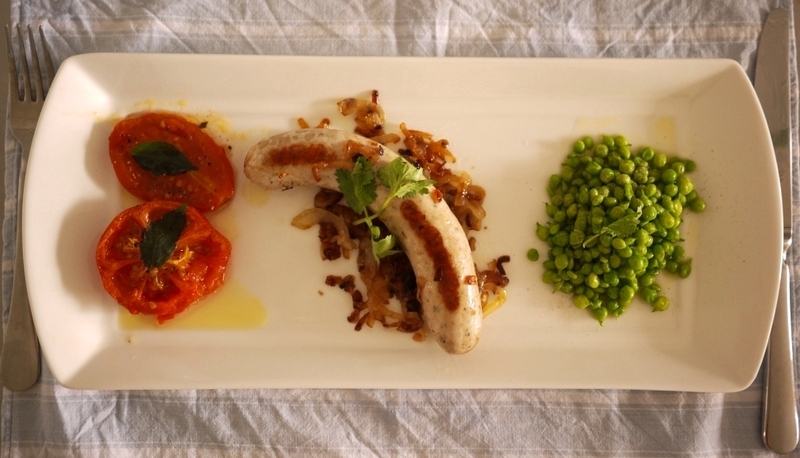 This entry was posted in Cook and tagged Plat du Jour on December 6, 2011 by three3seconds. 2 chicken thighs, seasoned in juice of half a lemon, olive oil, paprika, salt and pepper. Roast in a preheated 200 deg Celcius oven for 45 mins or till skin is browned and slightly crisp. 2-3 tables of fresh mixed herbs – cilantro, mint and/or dill. Mix all ingredients and season with salt and pepper. Sprinkle paprika if desired. Roast peppers in 220 deg Celcius oven until skin is charred (about 45 mins). Place in bowl and cover to steam. When cool enough to handle, remove skin and seeds. Tear into slices, garnish with pitted black olives, drizzle with olive oil and season with salt. 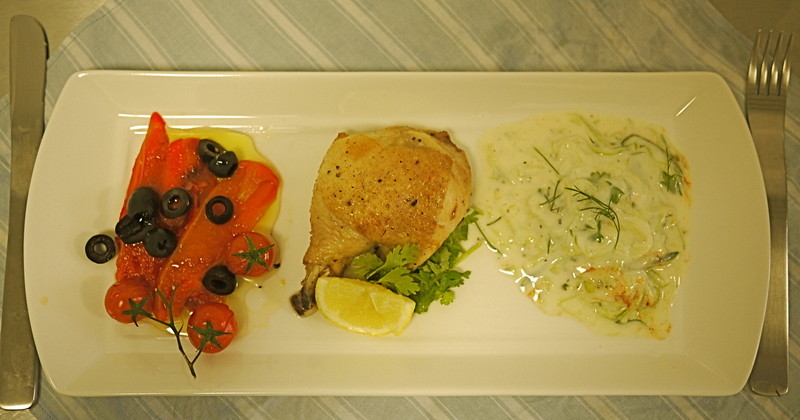 This entry was posted in Cook and tagged chicken, French, Plat du Jour on December 1, 2011 by three3seconds. Throw a handful of french beans (ends trimmed) into a pot of boiling water. Boil for 5 mins or until just tender. Strain and toss in butter. Season with salt and butter. Drizzle olive oil over cherry tomatoes in a baking dish. Season with salt and pepper. Roast in a preheated 200 deg Celcius oven for 10 mins.